$300 World’s THINNEST Noodle + INSANE LUXURY Chinese Food – HUGE Chinese Seafood FEAST – RARE!!! The World’s THINNEST Noodle is in Chengdu, China! Today, we’re going for an expensive $300 Chinese Food and Sichuan food FEAST at Yuzhilan Restaurant in Chengdu, Sichuan, China! We’re eating $300 worth of ULTRA LUXURY Sichuan cuisine and Chinese seafood. Get ready to eat the thinnest noodles in the world, Sichuan Kung Lao Lobster, Sichuan Caviar, Sichuan truffles, Abalone, Sea cucumber, spicy eel, strange flavour noodles, birds nest soup, and MORE!!! Make sure to watch until the end because you’re not going to want to miss any of these amazing and SPICY Sichuan seafood flavours! In Chengdu, China, there is some of the best food and restaurants in the world. In my previous street food tour videos of Chengdu, China, we’ve brought you to hundreds of delicious street food locations. We’ve shot hundreds of Chinese street food tour videos. 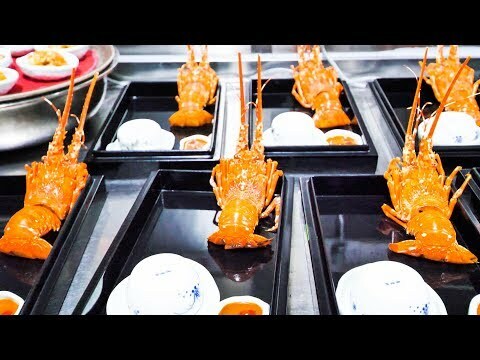 You’ve watched us eat CRAZY Chinese street food like GIANT LOBSTERS and HUGE KING CRABS, massive bowls of dan dan noodles and more, but today, we’re upgrading and going ALL OUT for a $300 per person splurge at Chengdu’s best restaurant; Yuzhilan, owned by the best Sichuan chef in China, mr Lan. Chef Lan has been working his craft and cooking the best Szechuan cuisine in China for over 35 years, and today, he’s bringing us in to his home kitchen to see how he makes some very special dishes. He is sharing with us his philosophy of cooking and his deep love for Sichuan cuisine, sharing his personal story of learning how to cook Sichuan food and how he has traveled the world to study how to cook. After living in Japan for 2 years and studying in London, he has spend his life perfecting the art of Sichuan cuisine, using only the best local ingredients to bring out the natural flavour in everything he prepares. As soon as we walked into his kitchen, Chef Lan showed us how he prepared his abalone. He explained to us the significance of Abalone in Hong Kong and Guangdong cuisine and how he has used 4 different styles of cooking abalone to bring into his own Sichuan style. It was amazing to watch the stock bubbling and the soft abalone simmering away. After this, Chef lan showed us the AMAZING Kung Lao LOBSTER! A dish he is proud of and worked hard to master, the kung pao lobster was amazing to witness. It was spicy and sweet and served cold with a bowl of guaiweimian AKA cold “strange flavour” noodles. As the lobster was being plated, Chef Lan brought us into his main noodle preparation area, where he uses a MASSIVE blade to hand cut the THINNEST noodles in the WORLD! This was so incredible to watch! Just like watching a taiqi master practice his moves, watching Chef Lan cut the noodles was an unforgettable experience! After he cut the noodles, Chef Lan showed us how each noodle could fit through the thread of a needle! And then it was time to eat this AMAZING Sichuan food! Luxury Sichuan food at it’s finest! There were over 20+ items on the menu, all cooked in Sichuan style yet upgraded flavour wise because all the ingredients were so premium! Some of the crazy LUXURY Sichuan foods we ate were: Hot Pot Chicken, chinese Matsutake mushrooms with chinese yam and soup, SUPERIOR Abalone, Hot and Sour DEEP Sea cucumber, Chinese bird’s nest soup, Yuxiang Style Eggplant and Yuxiang style eel, Sichuan dry style rabbit with Sichuan pepper and fermented soya bean, KUNG PAO Lobster, Sichuan Caviar, and more!! Make sure to enjoy this entire video until the end because there was SO MUCH INSANE LUXURY Sichuan food you’re going to love!